The organic elements of municipal solid waste are currently composted, fermented or incinerated, despite the industry’s desire to move towards a circular economy. The chemical industry, meanwhile, is keen to reduce its CO2 emissions through the use of materials not produced from fossil sources. Both industries’ needs could potentially be met if organic waste could be turned into building blocks for the chemical industry. 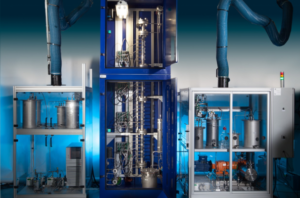 Innovation: Under the flag of Shared Research Center Biorizon, EARTO member TNO worked with 11 value chain partners to develop a blueprint for a pilot plant that can convert organic municipal solid waste into furanics. These are the valuable raw materials to produce bio-aromatics which are used by the chemical industry to produce plastics, lubricants, coatings and packaging. By swapping the chemical industry’s fossil sources for waste such as manure, sieve fraction, SSO and nappies, the Waste2Aromatics project has the potential to be a game-changer for both industries. Impact expected: The innovation represents an important shift towards the bio-based economy as well as a rare green solution that is no more expensive than its predecessor. Fully utilised by waste companies in Europe, it could produce 15 Megatons of bio-aromatics, surpassing Europe’s current demand. Reduction of CO2 emissions of up to 75% could be achieved by the chemical industry. Embracing the technology would also make Europe less reliant on imported fossil feedstock. TNO, an independent Research and Technology Organisation, has some 3000 professionals who put their knowledge and experience to work in creating smart solutions to complex issues.